Recently, when I received a box of beautiful pears from the Hood River Valley, east of Portland, I was thrilled. Pairing (ha!) recipes to fruit, I poached several of them — some in wine, others in maple syrup — only to wonder why I had taken a perfectly delicious piece of fruit and made it into something overly sweet but not ultimately better. The rest of the pears I ate out of hand, coupled with cheese, slipped into salad, and dropped into cake batter. This simple cake, in the tradition of coffee cake, easily adapts to various fruits and toppings. Serve warm with a glass of cold milk or cup of hot tea or coffee. Preheat the oven to 350 degrees. Grease and flour a 9-inch square baking pan; set aside. In a large bowl, cream together the butter and sugar for a couple of minutes. Add the egg and vanilla and continue to beat, 2 to 3 more minutes. Alternate adding half of the flour mixture and the half-and-half to the batter, mixing only long enough to incorporate each. Once smooth, spoon the batter into the prepared pan, spreading evenly into the corners. Peel, core, and slice the pears. Toss with the lemon juice. 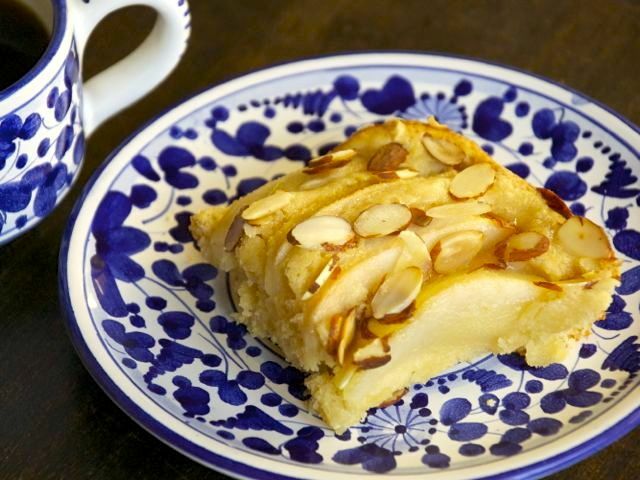 Arrange the pear slices on top of the batter, then sprinkle with the almonds and sugar (or cinnamon-sugar blend). Bake for 45 to 50 minutes, until golden on the edges and cooked through in the center (test with a toothpick; if it comes out clean, the cake is done). Serve warm.